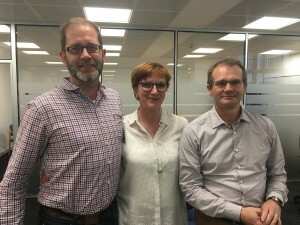 The new WHA board has been formally sworn in and had their first board meeting in the REA offices in London yesterday. Congratulations to Neil Harrison, the new chair (left) & Julian Morgan Jones now Deputy Chair. Here with REA CEO Nina Skorupska the first WHA board meeting. A representative of the REA automatically sits on the WHA board. James Court, the Head of Policy & External Affairs has taken over in this role from the REA’s CEO Nina Skorupska. Thanks for everyone who threw their hats into the ring for the election and well done to the new board members and those re-elected! 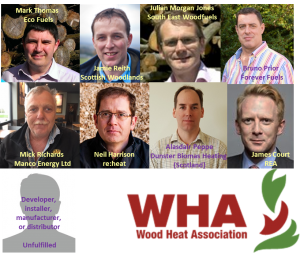 At the first board meeting yesterday Neil Harrison of re:heat was elected to become the new Chair and Julian Morgan Jones of South East Woodfuels was elected to become Deputy Chair – a reverse of their roles under the previous 3 year WHA administration. Well done to both – the future direction of the WHA is in safe and secure hands. We know that both will put a great deal of effort into their roles and push for improved biomass policy support.